I know how continents are formed and how they evolve over time but what does it look like under the surface? The crust of the planet is mostly made of rocks but there are also different types of minerals to be found scattered around. These can be quite valuable for those who can find them. How can I figure out what kind of minerals to expect in specific areas of the planet? I'm not a geologist and therefore, have no idea if the question is too broad. If you think it is, focus on the native elements. I'm mostly interested in : Gold, silver, copper, iron, lead, tin, zinc, platinum, sodium. This is part of a series of questions that tries to break down the process of creating a world from initial creation of the landmass through to erosion, weather patterns, biomes and every other related topics. Please restrict answers to this specific topic rather than branching on into other areas as other subjects will be covered by other questions. These questions all assume an earth-like spherical world in orbit in the habitable band. Making a mineralogy map requires a list of desired resources and a little create drawing. There are three kinds of rocks, sedimentary, igneous and metamorphic. Each type of rock is formed in a different way and provides different resources. Since this map is for a world from scratch, the author can do whatever they want/need in order to move the story forward. As long as ore families are respected, it will take a geologist to point out any errors or inconsistencies. This is especially true since you can invent the geological history to match your needs and most stories don't go into crazy detail about the geological history of your world. Igneous rocks are formed from magma, generally in volcanoes though not always. They have a tight crystalline structure and are tough to break. Examples include basalt and granite. Sedimentary rocks form from eroded rock pieces by wind or water that then settle in a stable location. Time and pressure fuse the stone grains together to form a new type of stone. Most dinosaur fossils are found in sedimentary rock. Metamorophic rocks were once igneous or sedimentary rock but were changed by heat and pressure in the earth's mantle or crust. Gold There are four ways of mining gold, placer mining, hard rock mining, byproduct mining and processing. Placer mining is done with sluice gates and pans. If you've heard the term "panning for gold", this is placer mining. It has the lowest barrier to entry of all the techniques and relies on one of three kinds of surface gold deposits. Silver,Tin, and Lead are often found together in deposits of galena in metamorphic or sedementary rock formations. Copper, Nickel and Platinum are often found together. Zinc is often found concurrent with nickel or lead. Iron comes from metamorphic and igneous rocks. The best iron ore is Magnetite. Sodium is "mined" from salt deposits, usually ancient ocean basins that have dried out. Given the soft nature of sodium chloride, it's unusual that these will be found on the surface because of weathering. Oil usually comes from sedimentary rock but can come from igneous and metamorphic rock too. Diamonds come from metamorphic rocks formed deep in the mantle. Decide which kind of resources you want to have in your story. The list can be as long as you can stand. Look up which kind of stone yields that resource. If the story is for an adult audience, placing so many resource near each other may prove beyond the suspension of disbelief. If the story is for children or young adults, they likely won't know enough about geology to know that something weird is happening. You can make maps of more specific rock types for specific areas. As you can see the outlines of various rock zones tend to clump together but don't often form hard-boundaries. Keep making the maps as detailed as you need in order to fulfill your needs. If desired, do a sanity check with a geologist to see if your map makes sense. 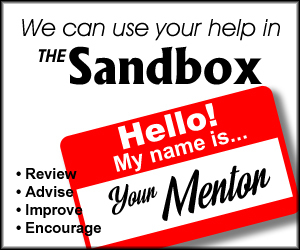 Earth Science SE is a good place to ask if you don't have a geologist handy. As the author, you can invent whatever kind of geology you want to suit the needs of your story. While improbable, it's not impossible to have igneous, metamorphic and sedimentary rock deposits with a walking distance of each other. It just depends on the geological history of that area and you've got billions of years of world history to make the geology be exactly what you want. Again, I'm not a geologist, but a good place to start would be working out where your tectonic plate interaction boundaries lie. These areas often experience high vulcanism, and would be both fertile and full of igneous rocks, metals and elements not usually found elsewhere. Another important thing to consider is the geological history of your planet. If an area, way back in the past of the planet, was a swampland, it might now have a high instance of chalk and flint deposits, or have been compressed into coal. Similarly ancient oceans would deliver oil reserves, or just be nutrient rich. Past volcanoes that have since been either eroded away or subducted (pretty sure that's the right term?) could yield gem deposits near the surface, or useful metal veins. Some materials like gold are easiest to find near waterways that are slowly eroding the deposits. This wouldn't need to be mined, instead it can be panned for or collected, and is fairly obvious if you're looking at a pre-industrial or very early civilisation. Disclaimer: I am not a geologist. All the minerals listed in the follow-up post (gold, silver, copper, iron, tin) are elements. None of these elements can be created on Earth. The conditions to create these elements requires supernovas or other similar events that do not occur on Earth. When people locate veins or deposits of these elements, those deposits are the result of millions of years of these elements being concentrated in one place, thanks to erosion and other natural forces. Gold, silver, and iron: These elements are present in microscopic amounts all over the world. They are too heavy to be a part of the atmosphere, so they fall to the ground. Then, due to erosion, these microscopic amounts of minerals end up getting concentrated in the lowest areas (for anyone familiar with Calculus, they end up in the local minimums). This is also where water tends to collect. Over time, water tends to end up in the ocean (or lakes). These microscopic minerals get swept along with the water. Therefore, these microscopic amounts tend to start concentrating in significant levels in the ocean (or lakes). A quick word about lakes: not all lakes will do. Microscopic amounts of gold don’t just float around in space by themselves. Lots of other minerals are out there too. The lakes that end up with enough microscopic minerals to start forming veins on their own will also have significant amounts of lots of other minerals as well. Therefore, humans (or presumably to any other sentinent species that drinks fresh water) would consider these bodies of water as mineral springs, brackish, or otherwise obviously not fresh. Now you’ve got a large body of brackish water with a bunch of mineral atoms in it. That’s a good start, but more is needed. This is where the process of gold and silver differs from the process for iron. If you put one room-temperature fleck of gold next to another room-temperature fleck of gold, they don’t spontaneously join together. You need a lot of heat. In nature, this is commonly found in underwater volcanoes, magma vents, and geysers. To find these vents, you’re commonly looking for either 1) the edge of a continental plate, or 2) a really thin part of the crust. With enough seawater passing over the heat source, the gold or silver starts to coalesce out of the water. Gold and silver both have relatively low melting points in comparison to other minerals. This is why veins of both are extremely pure. If you have a blob of molten quartz and gold all mixed together, the quartz will solidify before the gold does. (If you’ve ever looked closely at ice cubes, you will see the same process. The water turns solid before the impurities do. So all the impurities end up being pushed in the same general place.) So now you have a bunch of gold and silver veins cooling at the bottom of an ocean next to some magma at the edge of a continental plate. This is where gold and silver are most commonly located. Unfortunately, humans will have a difficult time getting to it. More on this in a minute, as I pause to discuss iron, copper, and tin. Iron loves oxygen. When iron is found in nature, it is typically a part of some other type of rock. Hematite is common. Therefore, for iron to form out of water, you need your water to hold very still and contain an unusually large amount of oxygen. Peat bogs are good for this. This process tends to go in waves. You have a strong growth period for your algae, oxygen goes up, iron gets concentrated. Algae dies, oxygen drops, other minerals get concentrated. Algae blooms, iron gets concentrated again. This process goes on for millenia, and you end up with a bunch of rock that’s alternating layers of iron and something else, sitting at the bottom of a bog. This rock is called banded ore. Molten copper is in the mantle of the earth. When copper-rich magma cools, you get copper veins inside of some other rock. Quartz is common. As discussed in the gold and silver section, magma is commonly found in volcanoes, at the edge of continental plates under the ocean, deep below hot springs, and anywhere else the crust is unusually thin. Gold, silver, copper, lead and zinc are all commonly found together, because all these items involve magma in some way and they all have similar melting points. Like copper, molten tin is present in the mantle. When tin-rich magma cools, you get tin veins. However, unlike copper, tin does not typically form pure veins. Tin is commonly found as part of cassiterite ore. Cassiterite ore is somehow associated with granite. Granite typically is formed when magma cools very, very slowly. When magma cools below the surface, you have a better chance of getting granite than if the magma becomes lava. Now you’ve got your veins of minerals, but they are deep below the earth and generally unaccessable to humans. Plate tectonics brings them up to the surface. At first, they are buried under layers of mud and sediment and other minerals. If the minerals are in low-lying areas of the continent, erosion acts to dump more mud and sediment on top of the minerals. Once plate tectonics brings the minerals to higher ground (i.e. becoming parts of mountains), erosion (predominantly due to water action) removes the top layers of sediment and exposes the minerals. Visible chunks of the minerals are found in the streams of the mountains. This tells humans that there are veins nearby, and they go search for them. These minerals can be formed anywhere your continent was once covered by brackish water, or was once close to the mantle. Basically everywhere. But they will only become (relatively) easy to find when water erosion and gravity help remove the intervening layers of crud and starts showing the minerals. You’re looking for mountains near oceans in tectonically active regions (expect earthquakes and possibly underwater volcanoes). In the event of gold and silver, you are also looking for hot mineral springs anywhere in the world. Tin is usually found as part of cassiterite ore in streams near granite-rich mountains. Copper is found usually in veins of quartz, possibly in conjunction with gold, silver, lead, or zinc, in areas which were once molten. Iron is found as part of hematite ore in bogs or mountains that were once bogs. I leave you all with this quote from The Age of Gold: The California Gold Rush and the New American Dream by H. W. Brands (Kindle location 7451), attributed to Edward Hargraves, 49er: “My attention was narturally drawn to the form and geological structure of the surrounding country, and it soon struck me that I had some eighteen years before, travelled through a country very similar to one I was now in, in New South Wales. I said to myself, there are the same class of rocks, slates, quartz, granite, red soil, and everything else that appears necessary to constitute a goldfield.” Hargraves then used this observation to search for gold in New South Wales and found it. It must be noted that this type of terrain is not guaranteed to yield gold. It is also not the only sort of terrain in which gold can be found. But there seems to be some evidence for correlation. To research this post, I used www.Reference.com, www.australianminesatlas.gov.au, www.amnh.org, www.geology.com, www.mindat.org, The Age of Gold: The California Gold Rush and the New American Dream by H. W. Brands, and Geology for Dummies by Alecia M. Spooner. Even us cosmologists and computer scientists involved in the field don’t understand exactly how this process happens, but let me see if I can give you an answer from the viewpoint of this cosmologist. First, you really need to understand how metals are produced, either from the Big Bang or cosmic rays to what is inside different types of stars, and how and how much or little is expelled when the star explodes. 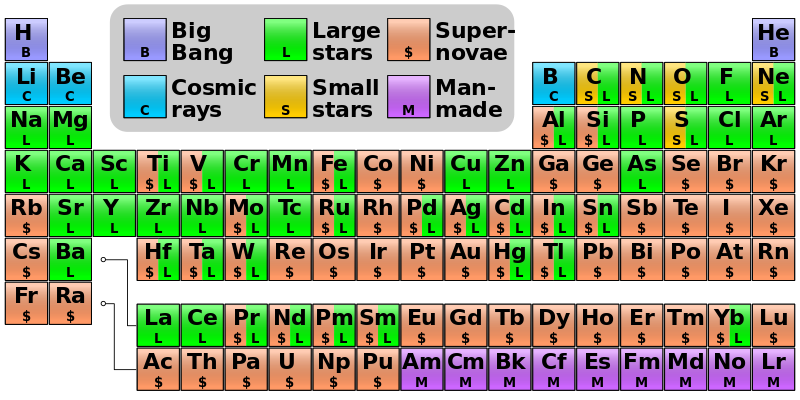 Even man-made metals/elements (Periodic Table below). When a star explodes it scatters all its heavy metals, gold, silver, copper, iron, lead, tin, zinc, etc. in 360 degrees. But not every star that explodes produces all the metals. Some stars produce only a few as this National Geographic article explains. Now when a star starts to collapse on itself, this is when the heavy metals start forming from iron and the heavier metals stay closest to the star’s core, such as gold, which is why it is one of the rarest of metals. And a theory also states that since these materials are heavier, the are more likely bound by gravity which increases their escape velocity. However, especially with gold and silver, physicists differ in how these metals are created, what type of star is needed to form them. Many do not give up any of the heaviest of metals. For the longest time, a Supernova was required to produce gold, but a 2013 article in Smithonsian Magazine cites a study where astronomers now think that gold is produced when two neutron stars collide. These stars are the size of a small city but almost twice the density of our Sun. Recently it was discovered that Earth was bombarded with radioactive Iron-60 from several close exploding stars as in this SpaceAnswers.com article. And even this article states that minuscule amounts were deposited on the Earth. So the second thing that occurs when a star does explode, besides scattering its materials in all directions, it does not expel everything. The heavier the metal, the less of it the star will release. You’ll see why when you look at a cross-section of a star just as it is about to explode. So in layman terms, you now know what is ejected from an exploding star, and in order of diminishing quantities. Another factor to consider is that heavier objects will tend to clump, or due to its mass, become gravity bound to each other. So gold will clump together with other gold elements, silver with silver, copper with copper, and so on. As the accretion disk starts to form (it is now known that a supernova explosion does produce all the material to form new stars) this mixture of clumps of metals and dust (that eventually form rocks) will start attracting each other. The problem is distribution out of the supernova. This is why in some areas on Earth you find tons and tons of gold in veins and large chunks, and other places not even a spec. It has to do with the early formation where the elements tend to stay together in clumps. Copper, a more abundant mineral, is found almost all over the Earth, but it too will concentrate in certain areas for the same reason gold does. But because it is a lighter metal, more of it is expelled from the star, and it will concentrate in larger amounts in more places on Earth. Now as the Earth is forming, is is molten. All the heaviest metals will sink deeper into the Earth than the lighter metals, which is why you can find copper very close to the surface, if not on the surface, and you need to dig 1/2 mile or more down to find gold and silver. Same with Iron. It also sinks deep into the center of the Earth. Any planet that forms like Earth will have the same issues with metal distribution. It will not be uniform, as it did not come out of the star that way, and that makes the heaviest of them harder to find. But when you do find a heavy metal like gold or silver, you will find a lot of it concentrated in the area of original discovery. That’s one reason the west had a gold rush, but has anyone heard of a head east young man, gold was found? It was just the luck of the draw where the gold from one or more exploding stars wound up. Yes, our metals are most-likely the product of several exploding Supernovae. There is no way anyone will tell you, looking at a current map of minerals on Earth, that the same locations will hold the same minerals. Many factors determine how much, if any, of the metal is even found on Earth. For example, nickel is natural to Earth, yet most of it is deep inside the Earth. Because it is in many asteroids in our solar system, it is the 5th most abundant element in the Universe, but when found on Earth's crust, it's from asteroid impacts after the Earth cooled. A planet even has a chance to not have any gold in it at all! Take the Moon. While there is gold and silver on the Moon, it has only been detected recently in the ice of the South Pole. Earth is devoid of Helium 3. Yet our Moon, which came from Earth, is loaded with Helium 3. Why? Luck of the draw? Helium 3 comes from the solar winds, which our magnetic field prevents helium 3 from reaching us. If you are looking for a scientific approach, there is no secret formula that says an Earth-like planet will have 10 percent gold, 20 percent silver, 80 percent copper, etc. It does not work like that. The planet Mercury has a lot of iron, the beneficiary of the Sun’s gravity. You would think that heavier metals would be gravitationally attracted to the Sun. Even after all the minerals and metals have been placed on the Earth during its formation from both gathering material from the dust of the accretion disk and bombardments by comets and asteroids, water and wind and other forces over time moves these around. As I said earlier, far more heavier metals made it towards the center of the Earth, but from water to lava flows to plate tectonics, minerals can concentrate around geographic features. Like a miner who looks for quartz to find silver. When you map out your world, you also need to take into consideration these geographic features. For even if the Earth did not receive a certain metal or mineral, chemical reactions can create them over time, like turning carbon into diamonds. Good luck. Placement of metals, removing the laws of physics such as gravity and amounts produced in the Universe, is a crap shot. But make sure that if you place gold or silver or copper that you also place its corresponding geographical features along with it. Broadly speaking it is very difficult to come up a answer to this.When looking at the distribution of mineral deposits on a planet one thing to bear in mind is Geological time. A place may not be on an active plate boundary now but millions of years ago it may have been. Take the UK and the British Isles, stable now but at the end of the Ordovician and the start of the Devonian the Caledonian Orogeny was occurring and there was an active subduction zone there. This has lead due to the igneous activity of the past to deposits such as Gold and Silver in Wales, Scotland and Ireland that are worked today. This means that metal ores can be found in many different places on the world not just where today's plate boundaries are found. 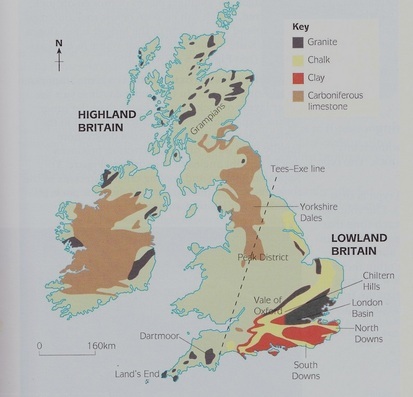 I have to disagree with Greens assertion that finding mineral resources close together is unbelievable, due to the way these processes work it is quite common to find many valuable ores close to each other in different concentrations, take Cornwall and Devon in the UK mining of tin, copper, silver , zinc and arsenic all occurred in close proximity to each other. The source of these metalifferous reasources was the granite batholiths that form moors such as Exmoor and Bodmin Moor. Some places where metal ores an be found are due to quite interesting sources, take the Sudbury Basin in Canada. It is the second largest impact crater that has been identified. 1.85 billion years ago a large body hit the surface of the Earth causing a a massive crater which instantaneous filled with magma as it cooled this lead to areas, mostly around the rim of the crater to form zones enriched in metal ores. Much of the nickel mined has come from there. Look for geologic activities that concentrate the minerals. You can find veins of gold or silver (and other metals) in volcanic areas. Specifically, miners in the US northwest (I'm using Kellogg, Idaho for my example) look for quartz veins in the rock. Those veins sometimes have veins of silver running through them. The veins form from steam leaking out through cracks in the ground. The quartz gets deposited on the sides of the crack and then when the crack is narrow enough, silver is deposited until the crack closes. Once they find silver inside a quartz vein, they just dig to follow that vein. So, one place to look is where there is current or former volcanic activity. Not the answer you're looking for? Browse other questions tagged geology worldbuilding-process natural-resources or ask your own question.